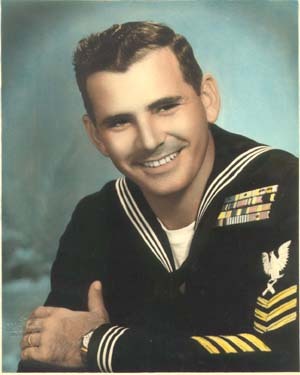 Richard C. Crawford was a Pearl Harbor Survivor on the USS West Virginia. His father, James G. Crawford was also serving on the ship at the time of the attack. Richard C. Crawford, Chief Gunner's Mate, born Aug. 2, 1924, Joliet, IL, attended high school and military schools. He joined the USN Aug. 2, 1941, and was stationed aboard the USS Minneapolis; USS Mead; and the USS Casablanca. Memorable experiences include all of WWII and Korea; two years in Shanghai; two years in Hong Kong; and two years in Alaska. Crawford retired May 10, 1962, with the rank of Chief Gunner's Mate. He received all the usual awards, two Purple Hearts and Korea. Married Wanda Jo and they had one child. Retired as an administrative manager from GTE, Western Region. Read a story of Richard Crawford's Pearl Harbor Experience here.